We’ve talked before about Project Yourself here on Mashareeb (check it out here in case you’ve missed it) and we were glad to make it to their one year celebration. 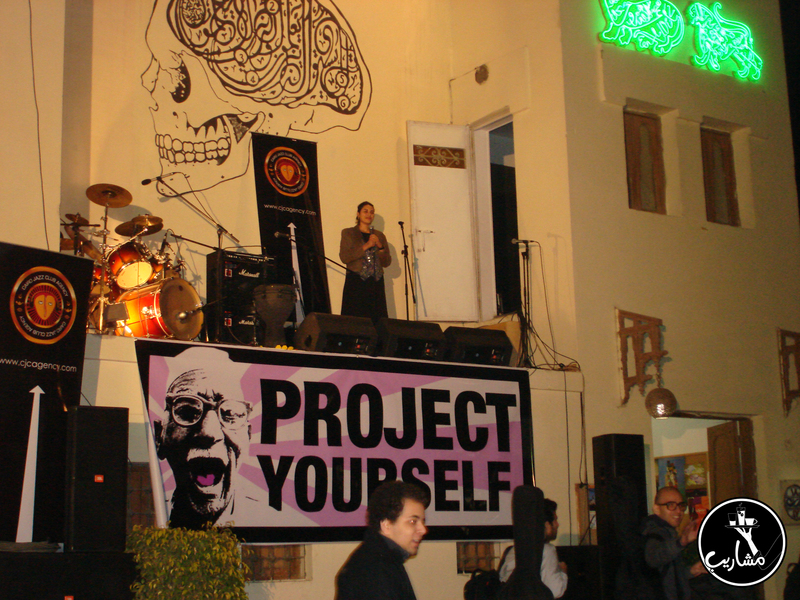 The event was sponsored by the Cairo Jazz Club Agency and was held in a very interesting location, a cultural center located in Old Cairo by the name of Darb 1718. The stage was also unusual, a high gap inside Darb‘s building, almost like a low rooftop (the scene of people performing from up there was very reminiscing to The Beatles‘ famous rooftop concert). The crowd had beans bags to relax on, hot and cold drinks and thankfully no rain to ruin the night. The show had a lot of various performances like rock bands, acoustic bands, stand-up comedians and even people talking and reading poems, so it was far from boring. Since Project Yourself open mics are usually a good event to discover new Egyptian talents, we decided to give you a brief summary and review on the performers who were there (these performers were voted by the Project Yourself fans to perform at the celebration night). Shady performs with an acoustic guitar and sings, he also sometimes plays with a full band. At the event, he performed with Ahmed Bahaa (from The Percussion Show) on the percussions and offered a variety of up-tempo and down-tempo originals. Mohamed Fahmy is an arabic stand-up comedian who’s humor is mostly about him telling you stories of hard times he has been through. Mohamed started his performance by singing a funny arabic version of Jingle Bells that he wrote with his cousin (bent khalto if you were curious) and proceeded with telling us his funny story about breaking his neck. This band is like an Egyptian combination of Flights of The Conchords and Weird-Al Yankovic. High On Body Fat is an acoustic band composed by Marwan Imam on bass and Ahmed Safi El Din on guitar and both of them on vocals. They simply play parodies of famous songs with pure sarcastic Egyptian humor; like turning Lady Gaga‘s “Bad Romance” into a story about eating “Bad Betengan” and Pink Floyd‘s “Another Brick in The Wall” into a song about video game geeks singing about playing “beles-station”. Rami is an Egyptian who moved from Canada to Egypt a couple of years ago, he’s a stand-up comedian who performs in English. Rami complains and rants about things he sees around him in the Egyptian society like Tamer Hosny‘s Pepsi commercial and the bbm messages he receives. Ramez started up his stand up comedy performance by thanking Mariam El Quessny and everybody responsible for Project Yourself existing. He kept making jokes about some of the past open mic night acts and then proceeded by telling jokes and funny stories about recent events following the Alexandria dramatic new year’s eve bombing and people’s reactions and behaviors towards it. Hany plays the guitar, the keyboard and sings. He usually performs with a live band but at the event he performed with Mustafa Kerdany on the percussions. He performed original songs, some where mellow love songs and some where angry revolting songs (on Caffeine! he apparently hates caffeine so much). Another good acoustic performance from the many that the night had. You might’ve seen him on Moga Comedy‘s Moga Stand-up shows or heard his voice on one of the FOX Series commercials or even on a Vodafone commercial. Khalid is a stand-up comedian who performs in arabic and have the talent of changing up his voice and sounding like TV commercial and movie trailer announcers (and obviously that’s why he does voice overs!). So, yes, he’s the Egyptian Pablo Fransico! He threw out a lot of naughty jokes, made fun of Egyptians speaking in English and even re-did Pablo‘s famous “Maria” joke (he did not steal it, he mentioned Pablo before telling the joke) and perfomed it in the spanish series arabic “fos7a” voice over sound. One of the most interesting acts of the night, Mr Makar usually performs with his daughters (making El-Makars) but they couldn’t make it to the event, so he did it all with his guitar and voice. He played some covers for famous 60’s songs (and improvised some lyrics to go along with the night and the event) and performed original songs too. Mr Makar was an interesting act because it’s very rare to see grown ups with families, kids and jobs in Egypt keeping up with their hobbies. Mr Makar plays well the guitar, sings beautifully and has a strong charisma and a good sense of humor, we think he delivered a good message to those fresh young talents to consider in the futur. The band’s name is just perfect, their performance is fun and it feels like…Jelly! A very entertaining band composed by Youssef Atwan, Omar El Nayal, Muhammad El Quessny, Nadah El Shazly and Mostafa Talaat. Their performance will put a smile on your face and their backing vocals put a very chaotic Egyptian ambience to their songs. They are an acoustic band with a tabla and they sing mostly in arabic about issues in the Egyptian society. The last acoustic act of the night, Rashad is another solo acoustic act with a very distinctive voice (close to Jason Mraz’s). He performed some original down tempo songs, that he himself has called “depressing”, and helped putting a mellow ambience to the crowd. From the south of the United States, Mo moved to Egypt after growing up in Dallas. His stand up comedy performance was mostly about him talking about what he’s going through living in Cairo and the awkward situations he encountered because of his bad arabic. We’ve been comparing some of these talents with western ones, not to give you the impression that they’re not original but to only try to make you grasp the feel of their performance and with Mohammed Shaheen we will say, the Egyptian Demetri Martin. His English stand up comedy performance is done with an acoustic guitar (like Demetri Martin!) but the subjects are mostly Egyptian. The jokes were very smart and funny (just like Demetri Martin’s!) and he nailed it every time he paused his guitar playing and dropped a word that would make people crack up. The only electronic act of the night, Neobyrd is not the Egyptian Daft Punk because it’s only Wael Alaa and not a duo (but he does perform in a mask, a leather jacket and a pair of gloves!). Neobyrd performs his songs live by playing them on the keyboard. His music varies from songs with a pumping bass and a heavy kick to mellow and chill ones and their production is very neat and well done. The thing that Wael does that makes Neobyrd special is the cyborg vocals he produces using the vocoder on some of his songs. A rock band composed by Shehab El Noury, Noor Ayman, Majid Hassan, Seif El Sobky and Box (yes, Mr Box). The band’s subjects are mostly social issues in the Egyptian society like being different and sexual harassment. The highlight of Ze Khodz‘s performance is the small details they put together to make their performance memorable and funny. Mr Box plays the guitar while wearing a box on his head, they were all dressed in ridiculous outfits and they would surprise people multiple times by playing death metal riffs and growls accompanied with double bass for like 4 seconds during one of their songs. And finally, they left people screaming “Enta 2ely kalt el batates!” because that was their drummer’s backing vocal line for one of the songs. It was wonderful night full of young (and old!) Egyptian talents, people we can like or dislike but never ignore. It was also a good chance for us to cover and review some of the talents Egypt has to offer and let you know about it here. Mashareeb would like to wish Project Yourself a very happy first anniversary and would like to re-state its support to their open mic nights that shed light on a lot of talents and gave a chance to people to show what they’ve got. They support Egyptian creativity, we also do, we are one and we are all together on the same mission.